The IGFA has released another round of potential world record catches. It?s important to note that while these fish are impressive, they are currently undergoing the review process, and as of yet can?t be officially declared world records. Alexandra Czabayaski was fishing off the coast of Cairns, Australia on Oct. 11 when she landed this enormous black marlin. It weighed in at 368 lbs, 9 oz, measured in at 256.54 cm, and was caught using mackerel. It is a potential junior record. On Nov. 22, Guillaume Fourrier landed two potential all-tackle world records while fishing off the coast of Dieppe, France. The first was an Atlantic herring which weighed 2 lbs, 4 oz, and measured in at 39.6 cm. The second was a tub gurnard which weighed 6 lbs, 11 oz and measured in at 58.9 cm. Both of the fish were caught using a Megabass X-Layer. Natsuki Kagehira landed a potential record akahata on Dec. 21 in Yonezawa, Japan. It weighed 3 lbs, 2 oz, measured in at 43 cm, and was caught using a grass minnow. This is definitely one of the more interesting species of fish that we?ve come across. Maria de la Luz Johnson landed this leopard shark on Dec. 31 in California?s San Diego Bay. It was caught using a dead surf perch, weighed in at 44 lbs, 7 oz, and measured 162.56 cm. Regular readers of this weekly column may recognize the Arostegui family. They?re back again this week, with three new potential record catches. Martin Arostegui caught a fortune jack on Jan. 4. The fish weighed 6 lbs, 4 oz, measured in at 62.23 cm, and was caught using a Bass Pro Vertical Jig. A day later, Martini Arostegui added two potential record catches to his repertoire. The first was a yellowfin surgeonfish that weighed 3 lbs, 12 oz, and measured 42.55 cm. The second was an orangeside triggerfish that measured in at 34.29 cm. 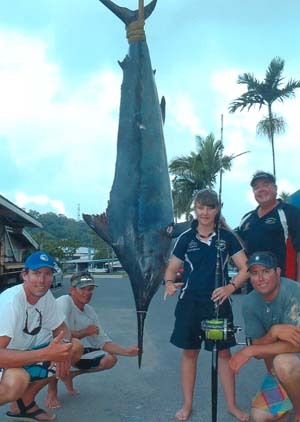 Both fish were caught in Golfito, Costa Rica, using cut bonito as bait.Click here for more world record catches.